Our Framers famously corrected several shortcomings in the English approach to lawmaking. In England, the same people who write statutes also amend the English constitution. We can thank the Framers for their foresight in Article V. Unfortunately, in the name of a living and breathing Constitution, our government increasingly takes the easier British path to amendments, through the government itself. Whether through a formal amending procedure or not, the corruption of both constitutions picked up steam after simultaneous Progressive victories in the early 20th century. Below, we’ll find that Progressive democracy won in 1911 and 1913 in the House of Lords and US Senate respectively. 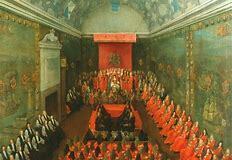 To pick up from Part I, we’ll begin with the House of Lords (Lords) in the 18th Century. The Lords, once a body of only about 50 members, were greatly enlarged by the liberality of George III and his successors in creating peerages. The individual influence of a Lord of Parliament was thus diminished. Recall from a number of Federalist Papers, Alexander Hamilton described the qualities of America’s middle-house. One of the Senate’s essential features was constitutional compactness. Limiting membership to two senators per state lent an air of exclusiveness not found in the House of Representatives. Along with peer-packing the Lords, the second corruption of balanced government was the loss of the monarch’s practical veto of Parliamentary bills. While it exists in theory to this day, the Glorious Revolution and Bill of Rights (1688/1689) diminished the Crown’s prerogative powers such that Queen Anne in 1707 was the last to exercise the monarch’s veto. It was understood that kings risked their jobs and perhaps their necks if they vetoed spending and tax bills from the Commons. To exercise any influence at all over Parliament, the Crown resorted to packing the Lords and buying votes in the Commons through “patronage,” by giving certain members (MPs) called “placemen,” salaried government jobs. Notice the reform of these practices in the US Constitution. Presidents have the limited veto and Congressmen/Senators may not hold executive branch offices. The 19th century marked several fundamental changes to UK governance. Heretofore, each member of the Commons didn’t so much as represent specific constituents in the American way, but were rather one of the body that in it’s totality represented the single estate of the common people of the UK. Likewise in the House of Lords, the geographical distribution of individual lords was irrelevant because when taken together they formed a single estate. Britain’s monarch was the final estate, one comprised of single person. Viewed altogether, the “King in Parliament” was conceptually government by three indivisible entities joined in common purpose: the general welfare of the kingdom. In 1831, the Commons attempted to democratize itself via a Reform Bill. Property qualifications greatly restricted the size of the electorate, and many district boundaries had not been changed for centuries. Some cities were not represented at all, while the eleven voters of Old Sarum elected two MPs to the Commons. The Lords rejected the proposal and didn’t yield until the King threatened to pack the Lords with eighty pro-reform Lords. All of this changed with the Reform Act of 1832 when the UK adopted the US approach to popular representation. The crisis damaged the political influence of the House of Lords. The Lords themselves initiated an important reform in 1868 when they changed their standing orders and abolished proxy voting which prevented Lords from voting without taking the trouble to attend. 20th Century. In 1909, David Lloyd George introduced the “People’s Budget” to the Commons which proposed a land tax on wealthy landowners. The conservative Lords defeated the measure. In response, Progressive MPs proposed severe curtailment of the Lords. Once again the King threatened to pack the Lords with enough Progressive peers to overcome opposition. The threat worked. At the same time Progressives in the US worked to democratize lawmaking through the 17th Amendment, the Parliament Act of 1911 effectively abolished the power of the House of Lords to reject legislation or to amend bills in a way unacceptable to the House of Commons. The law limited the Lord’s ability to indefinitely table bills from the Commons to no more than three parliamentary sessions or two calendar years. Money/taxation/appropriations bills could be delayed no more than one month. The act also reduced the maximum length of Parliaments from seven years to five. In American parlance, this was the near-equivalent of congressional elections every five years. Progressives put the kingdom on notice of the building wave of democracy. From the preamble to the 1911 Parliament Act, “it is intended to substitute for the House of Lords as it at present exists a Second Chamber constituted on a popular instead of hereditary basis, but such substitution cannot be immediately brought into operation.” Unlike the US Senate, the Lords are to this day not yet popularly elected, but the Progressive fix was in. Today, the House of Commons is limited 650 members. Thanks to centuries of occasional peer-packing, there are 791 Lords. Of these, only 90 remain hereditary seats; the rest are appointed. Such is the commingling of the estates that the majority of the Temporal Lords (non-Spiritual) are nominated by the Prime Minister of the Commons and appointed to life terms by the Queen.1 Imagine if Nancy Pelosi had nominated senators for President Obama’s consideration. While Lords may also take on roles as government ministers, high-ranking officials such as cabinet ministers are usually drawn from the Commons. To American eyes this blending of sitting MPs and Lords as ministers of the Queen is a horrid violation of separation of powers. In the British system this promotes a common purpose in major Progressive legislation that is typically served in the US by a popularly elected Congress and Progressive Deep State. Even with peer appointments by the Queen, the democratic element of society expressed in the Commons is supreme over both the Lords and Monarch. Like the US, early in the last century the UK forgot the purpose of government (general welfare) is not served by the rule of popular majorities. The effect of these amendments on both the US and British society were similar and equally awful. There is so much democratic electoral freedom yet liberty remains in decline. Both nations ignored the long lessons of history against democratized law-making. Aristotle so much as predicted the outcomes in the US and UK in which the subsequent failures of an ever-increasing democratic element didn’t produce the intended outcomes. 1. There are twenty-six Lords Spiritual, bishops of the Anglican Church.